Is the Earth overpopulated? While some less-informed population non-experts say “no”, most well-informed population experts voice an emphatic “YES”! Meanwhile, the majority of world citizens are either ignorant about the issue, or simply unconcerned. But everyone should be both concerned—and fully informed about the disastrous consequences of unchecked population growth. Just think about this: Every minute our overstressed planet adds a net gain (births minus deaths) of approximately 145-plus people every minute, which amounts to around 8,700 per hour, 208,000 per day, and 76 million per year—almost a fourth of the current U.S. population! At the current rate of 1.12% annual growth, world population could double in 63 years. Check out the Population Clock for an ongoing update. So, is discussing overpopulation politically incorrect? Or should we simply ignore this sensitive issue, regardless of its central role in fomenting most world crises, including climate change? World Population Balance’s newest podcast episode—“Tap Dancing Around Overpopulation”—tackles these questions, primarily in response to an explanation by journalist David Roberts as to why he avoids the topic. In addition, the question of “What do hurricanes Irma and Harvey have to do with overpopulation” is addressed. Finally, there’s good news on the teen pregnancy front. 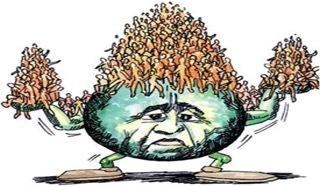 If you are unsure of what you think about overpopulation, I think you’ll benefit from listening to this thought-provoking discussion with World Balance Director, Dave Gardner, and staff members Carolyn VandenDolder, Alan Ware, and Joan Philips. Addition information is provided in the latest WPB newsletter, Balanced View (Fall, 2017). [Disclosure: Alan Ware, WPB Research Fellow, is our son, and we are sustaining members of WPB.]. Finally, if your interest is peaked, you might enjoy participating in the upcoming “Overpopulation Weekend”, Nov. 9 through 12, in Minneapolis. Events include two Meetups (discussion of population issues), a Film Fest, and a Potluck Supper. Specific details are available on the WPB website:http://mailchi.mp/worldpopulationbalance/6fm4u2btx2-3241990. We’d love to have you—and other persons interested in learning more about overpopulation—join us for these free informative events. > NPG: The Impact Of U.S. Population Growth On Global Climate Change (Edwin S. Rubenstein, pdf). On the first Earth Day, April 22, 1970, the greatest threat then was the prospect that future generations would run out of food, fuel, and natural resources. Neither global warming nor population growth was on the environmental radar. In retrospect, the 1970s was a Golden Age for conservation—a period when most Americans believed that changes in our consumption habits along with new energy-saving technology could control, or even reverse, the degradation of our natural environment. > Common Dreams: How to End Crony Capitalism (Robert Reich). A flood of big money into politics is buying giant tax cuts, allowing Russia to interfere in future elections, and killing Americans. That’s just the tip of the corrupt iceberg that’s sinking our democracy. When it comes to getting big money out of politics and ending crony capitalism, there’s no right or left, and certainly no middle. There’s just democracy or oligarchy. What if the anti-establishment wings of both parties came together in a pro-democracy coalition to get big money out of politics? > Yes! Magazine: Raj Patel On How To Break Away From Capitalism (Chris Winters).A new book by co-authors Raj Patel and Jason W. Moore—The History of the World in Seven Cheap Things—discusses the seven “things” that include a hidden social, ecological and economic infrastructure: nature, money, work, care, food, energy, and lives. “Cheapness” is a process of responding to economic crises by devaluing each of those seven forces so that capitalism can continue to concentrate wealth in the hands of the already wealthy. Reforming capitalism will require organized and frugal grassroots activism. > Common Dreams: Praying For The Moths And Beetles (Robert C. Koehler). How do we live within a system and mindset that devalues and diminishes most of life? We have to change course and all starting places have at least this much in common: reverence for the planet and life itself; acknowledgment and awe that the universe is alive and we are connected to everything in it; and a sense that even the small, mocked, discarded fragments of civilization are to be valued . . . that they are sacred. > Peak Prosperity: What Could Pop The Everything Bubble? (Charles Hugh Smith). The policy of creating trillions in new currency and buying trillions in assets has inflated an everything bubble, a bubble in all the asset classes being supported or purchased by central banks and their proxies. But there are some structural problems that can’t be solved by this mechanism. Some are primarily economic, some are primarily political-social, but all of them affect the entire system, not just the financial realm. Inflation is one problem and enriching the financial elites is another. > VOX: The Most Effective Clean Energy Policy Gets The Least Love (David Roberts). The Renewable Portfolios Standard (RPS) is a policy that requires a state’s utilities to get a certain percentage of their power from renewable sources by a certain year. RPSs might not be the most cost-effective way to improve air quality, reduce carbon emissions, or stimulate the growth of clean-energy industries and jobs … but they are real, working, doing all three of those things, right now, cost-effectively. > Yes! Magazine: It’s Not Just Nostalgia: “Real Things” And Why They Matter (Cecilia Andrews, review of The Revenge of Analog: Real Things and Why They Matter by David Sax). Too much of our time in our hectic consumer society seems like “not life”—phony and artificial. So being involved with “real” things—things you can touch or taste or manipulate is attracting people. Many are drawn to analog-based technologies, including real books, and experiencing empathy through face-to-face engagement with others, rather than through digital means. > The Guardian: Warning Of ‘Ecological Armageddon’ After Dramatic Plunge In Insect Numbers (Damian Carrington). Insects are an integral part of life on Earth as both pollinators and prey for other wildlife. According to a new study that has shocked scientists. the abundance of flying insects has plunged by three-quarters over the past 25 years, prompting warnings that the world is “on course for ecological Armageddon”, with profound impacts on human society. > Salon-Grist: Europe’s Hurricane-Fueled Wildfires Might Become A Recurring Nightmare (Eric Holthaus). Ophelia was the strongest hurricane ever recorded in the eastern Atlantic, with its deadliest impacts in Portugal and Spain, where deadly forest fires killed more than 40 people (60 forest Portugal fire deaths in June). These fires point toward the scariest aspects of the Antropocene: We are changing the world around us so fast that, in many cases, adaptation will be near impossible. > The Nation: Exclusive: The Interior Department Scrubs Climate Change From Its Strategic Plan (Adam Federman). According to a leaked draft, in the next five years millions of acres of America’s public lands and waters, including some national monuments and relatively pristine coastal regions, could be auctioned off for oil and gas development, with little thought for environmental consequences. Alarmingly, the policy blueprint—a 50-page document—does not once mention climate change or climate science. > Star Tribune-AP: Study: More Evidence Links Earthquakes To Energy Waste Wells (Dan Elliot). Scientists say they have more evidence that an increase in earthquakes on the Colorado-New Mexico border since 2001 has been caused by wells that inject wastewater from oil and gas production back underground, similar to human-caused quakes in Oklahoma and other states. Seismometers recorded 1,881 quakes in the area between 2008 and 2010, and 1,442 of them were in New Mexico. The strongest was magnitude-3.8. > Common Dreams: ‘New Gilded Age’ Reaches New Heights With World’s Billionaires Owning Staggering $6 Trillion (Jake Johnson). An analysis published Thursday found that wealth of the world’s billionaires grew by 17 percent in 2016, bringing their combined fortune to a record $6 trillion—more than double the GDP of the UK. The report also found that there are 1,542 billionaires in the world and more than 563 in the United States alone. To what extent is that sustainable and at what point will society intervene and strike back? > MedicalXpress: US Study Finds Rise In Human Glyphosate Levels (Staff). Levels of glyphosate, a controversial chemical found in herbicides [including Roundup], markedly increased in the bodies of a sample population over two decades, according to a recent study published in a U.S. medical journal. The increase dated from the introduction of genetically-modified glyphosate-tolerant crops in the United States in 1994. > Strong Towns: Building Tactical Resilience (Mike Lydon). Tactical resilience provides ways for local residents, businesses, and community leaders to collaborate with their local governments in developing the projects with the most potential to build the resilience of neighborhoods and, ultimately, of cities. Burlington, Vermont provides an example with its first citywide effort to improve walking and cycling. To build their resilience, communities have to do more with less, with do being the operative word. > Common Dreams: How To Prevent Nuclear War (Lisa Fuller). What can be done to build support for a peaceful resolution to the standoff with North Korea? The problems faced are lack of urgency, insufficient awareness about the potential consequences of a nuclear war, and no consensus about how to prevent it. If lawmakers think that their obedience to Trump’s warmongering will actually lose them the next election, they will be less likely to support him. That’s why active, large-scale public pressure is the key to preventing nuclear war. > Resilience: A World Made by Hand (Jody Tishmack). Human prehistory is described by the tools and artifacts left behind, that were both functional as well as art. In a world that has less energy available, a world that cannot afford to burn more fossil fuels, we need to move away from machines and back towards things made by hand. We need to learn to fix something that is broken rather than throw it away and replace it. We need to find ways to express our longing for making art, crafts, food, laughter, and lightheartedness. > P2P: Own Everything! Together! (Jacob Stringer). What is visibly failing is management of large-scale societies that are too big to adapt as needed. Escaping management requires a deep shift in thinking and a new set of institutions. Owning our world would share some of the problems of managing it, as it is so big, there is too much of it and too many of us. A call to own everything is a call for a democratic society. > The Atlantic: Better Sleep Can Build Emotional Resilience (Olga Khazan). During the fear-learning task, test subjects who spent more time in REM sleep had less connectivity between their amygdala, or fear center of the brain, and the ventromedial prefrontal cortex and hippocampus, brain regions responsible for encoding memories. The subjects with more REM sleep also had less activity in those areas of the brain. That suggests that the more well-rested subjects may not have been hard-wiring those fears into their brains quite as strongly. > Transition Twin Cities: Groups And Activities: Transition ASAP • Transition Longfellow • Corcoran Grows • Transition North Suburbs • Transition West St. Paul/West Side • Transition NE. > MN Department of Health: Climate and Health 101 Webinar, one per month through December and will continually update our webpage with information (registration links, copies of the PPT deck and webinar recording). > Alliance For Sustainability: Linking Citizens, Congregations And Cities For Sustainable Communities. Extensive listings of Minnesota news, events, and projects: http://www.afors.org/. > Citizen’s Climate Lobby: Regular Meetings And Events (www.citizensclimatelobby-mn.org); Meetings in 18 MN locations on the 2nd Saturday of each month to focus on bi-partisan Carbon Fee and Dividend Legislation; 40 members of the US House on the Climate Solutions Caucus are involved. > The New York Times: Climate Change Is Complex. We’ve Got Answers To Your Questions (Justin Gillis). Excellent brief explanations for the most asked questions. Please share. > Conversation Earth: Conversation Earth–Exploring Our Place on the Planet (Dave Gardner, Interviewer). This weekly Radio Series & Podcast provides surprising perspectives from leading thinkers on the most important issues of our time. > Population Growth: Population Clock – Census Bureau.